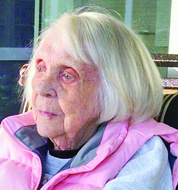 E. Evelyn Hardy, 100, of Deer Isle, Maine, passed away in Melbourne, Fla., on April 8 at the home of her daughter. She was a loyal daughter, sister, wife, mother, aunt and mother-in-law. Evelyn was born in Camden, Maine, on December 2, 1918, the daughter of Leon Stinson and Mabel Weed. She graduated from Camden High School and enlisted in the U.S. Navy when the WAVES was established in 1942. She served as a radio operator in Oklahoma and Hawaii. Following WWII in 1946, she married Harold Hardy Jr. They made their home in Dartmouth, Mass., where Harold began a construction business with his brother. During those years Evelyn was an active member of the South Dartmouth Congregational Church, a Cub Scout Den Mother, a Girl Scout Brownie leader and a Girl Scout Mariner mother. At retirement, Harold and Evelyn moved to Deer Isle, the home of their ancestors. They sailed their boat from Maine to Florida twice. She was a volunteer for the Deer Isle Historical Society, a member of the Deer Isle Grange, and a member of the Deer Isle Congregational Church. She was predeceased by husband Harold Jr., an infant son Thomas, brothers Edward Stinson and Andrew Stinson. She is survived by her son Robert Hardy and spouse Christopher Douglass of Norwalk, Conn., daughter Susan Gardner and husband Kerry of Melbourne, Fla., brother Clifford Stinson and Gene, nine nieces, and two nephews. A memorial service will be held August 3 at the Sunset Congregational Church in Deer Isle. In lieu of flowers, donations would be appreciated in her memory to the Deer Isle Congregational Church Building Fund or a charity of choice.